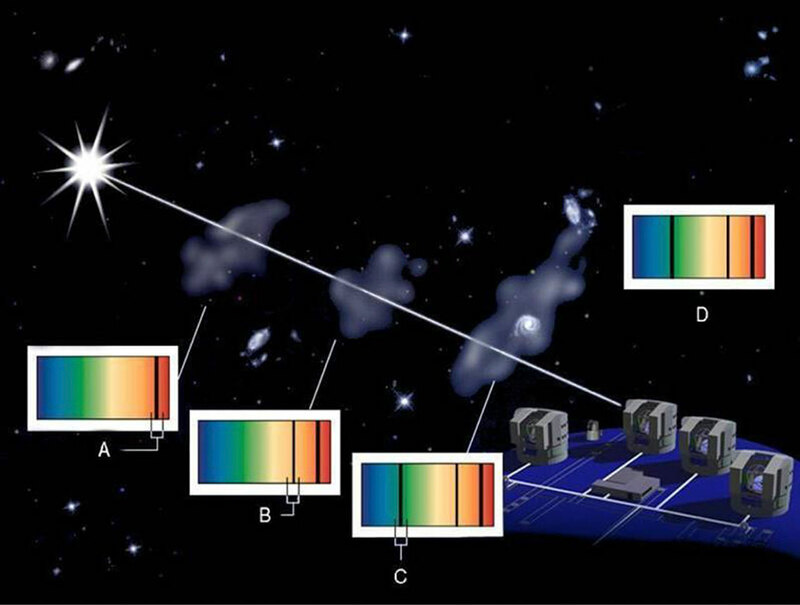 The same team had already broken the record for the most distant detection of molecular hydrogen in a galaxy that we see as it was when the Universe was less than 1.5 billion years old. 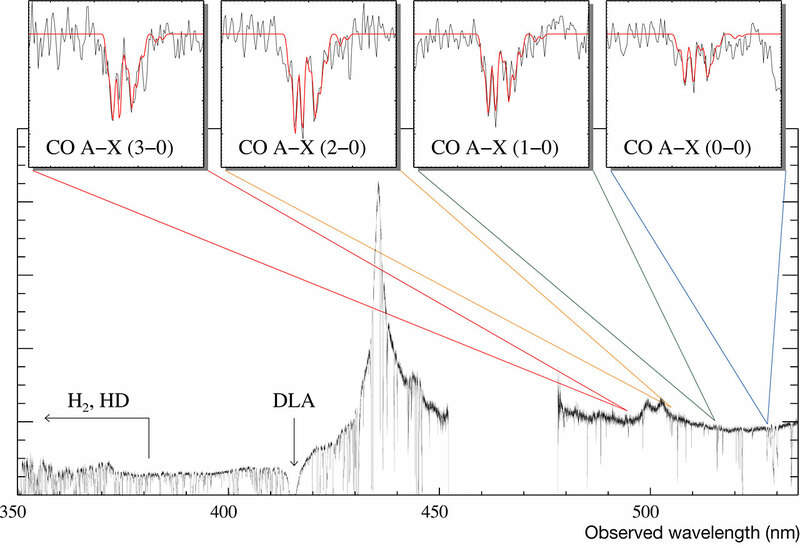 The results described here have been presented in a Letter to the Editor in Astronomy and Astrophysics ("First detection of CO in a high-redshift damped Lyman-alpha system", by R. Srianand et al.). : The team is composed of Raghunathan Srianand (IUCAA, Pune, India), Pasquier Noterdaeme and Cédric Ledoux (ESO), and Patrick Petitjean (IAP, France). The same team already made the first measurement of the temperature of the cosmic microwave background radiation, at a time when the Universe was only about 2.5 billion years old, also using UVES on the VLT (see ESO 27/00). At that time, they could only measure a temperature in the range between 6 and 14 K.
: Quasars are extraordinarily luminous objects in the distant Universe, thought to be powered by supermassive black holes at the heart of galaxies. A single quasar could be a thousand times brighter than an entire galaxy of a hundred billion stars, and yet this remarkable amount of energy originates from a volume smaller than our Solar System. : One of the fundamental predictions of the Hot Big Bang theory for the creation of the Universe is the existence of the Cosmic Microwave Background Radiation (CMBR). This relic radiation of the primeval fireball was discovered in 1964 by means of radio observations by American physicists Arno A. Penzias and Robert W. Wilson, who were rewarded with the Nobel Prize in 1978. Precision measurements by the COBE and WMAP satellites later showed that this ancient radiation fills the Universe, with a present-day temperature of slightly less than 3 degrees above absolute zero (2.725 Kelvin, or -270.4 degree Celsius). A particular prediction of the Big Bang theory is that the Universe cools when expanding, the temperature scaling with the dilution factor of the Universe (1 + redshift). At the redshift of the galaxy (2.41837), one would thus expect a temperature of 2.725 x (1 + 2.41837) = 9.315 K or -263.835 degree Celsius.